Harriet Walter told the group about a patron at Mary Stuart, who was apparently slightly bewildered and hard of hearing. As the show began, he was heard to loudly exclaim, "This isn't Blithe Spirit! 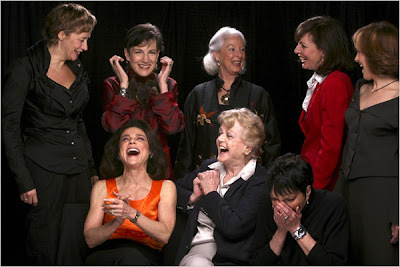 Where the hell is Angela Lansbury?" Used to work at San Diego's Old Globe Theater; during matinees (heavily patronized by the older crowd) stuff like that used to happen a LOT. Once during the murder scene in Othello a lady in her eighties shouted out, "Oh Mary! What's he gonna do?" We quoted that for years afterward. Love it. And Sibyl's story's great, too. Roxie - Do you think Helen Mirren will be amused if you yell that at Phedre in September?